Marshall, Gerstein & Borun LLP is pleased to announce the addition of Mark J. Levin as Chief Marketing & Business Development Officer. Most recently, Levin co-founded and served as general manager of The Right Profile, a company that provides talent assessment, management, and development services for law firms, law schools, and sports teams through its AttorneyAssessment and AthleteTypes offerings. “We are thrilled to bring on someone of Mark’s stature to lead our marketing and business development efforts,” said firm managing partner Jeffrey S. Sharp. “He is well-respected in the legal community and comes with an impressive track record of excellence in the development and implementation of market-leading branding and business development initiatives,” added Sharp. Levin earned his MBA at Northwestern University’s Kellogg School of Management, and his JD at the Chicago-Kent College of Law. 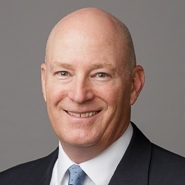 He has been in the legal industry in various capacities since 1995, working as an executive at Thomson Reuters and as a business development coach at Akina (now GrowthPlay) before becoming the head of Business Development and Marketing at Levenfeld Pearlstein, and then at Neal, Gerber & Eisenberg. “I am excited to join Marshall Gerstein, one of the nation’s leading intellectual property firms,” said Levin. “I look forward to working with this immensely talented team to build on its successes and help guide strategic initiatives that serve its needs both now and well into the future,” he added.